The change in Google's narrative over the past few months has been very interesting to watch. The recent "Peak Google" proclamations remind me of Facebook's post-IPO narrative in 2012. Conventional wisdom back then was that Facebook's decline was imminent as mobile was not a meaningful part of their revenue. Of course, Facebook's app install ads and other mobile initiatives disproved that narrative in short order. Some observers even make it seem as though Google's growth has seen a major slowdown in 2014. 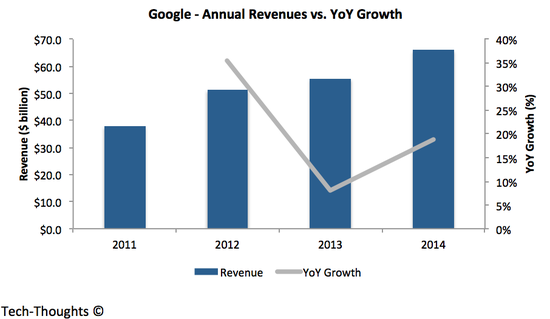 Interestingly, both Google's revenue and operating profit growth accelerated in 2014. This isn't to say that mobile does not pose a challenge to Google. It does, but it is important to understand exactly what those challenges are and the way forward. By looking at Google's financial reports, their biggest challenge is a decline in operating margins. This has been triggered by increase in search advertising on mobile, which delivers lower CPCs. While consumers used search on PCs for more involved research on products/services, the interaction window for mobile search is shorter. Lower ad engagement led to fewer bids on keywords and consequently, lower CPCs and margins. While there has been talk of "brand advertising" being the next big opportunity on mobile, a look at Facebook's mobile growth shows suggests that transactional opportunities remain massive. Facebook used app login data to create a targeting engine for app install ads, which drove a significant portion of their growth on mobile. As the app economy continues to grow and extend its economic influence beyond app store revenues, app install (or engagement) ads will remain a lucrative opportunity on mobile. This is one area where Google has been a laggard, even though they clearly have the assets (app usage data, access to developers/brands, Google Play, Google Now) to be a market leader. Unsurprisingly, we now have evidence that Google has not been ignoring this opportunity -- the company just announced the launch of app install ads on Google Play. In my opinion, this is Google's first step towards a major opportunity, i.e. contextual app install or "access" ads implemented via Google Now. This should provide a counter-argument to one segment of the current narrative surrounding Google. I have also heard another, more puzzling argument that goes something like this -- The next billion smartphone users will experience the internet for the first time. These users (e.g., a farmer in Africa or India) will have very different needs and far lower purchasing power, which could challenge Google's business model. It's not that I don't agree with this argument, I do. It's just that this argument is applicable to every tech giant in the world, from Google to Facebook to Tencent. These consumers may use Google search, Facebook, Whatsapp or a host of other apps. But they aren't valuable to Google or Facebook's advertisers and they aren't likely to be major in-app purchasers. How exactly are WeChat or Snapchat going to monetize these users? The answer I hear most often is "services". But which services? And how will they be monetized? In my opinion, there are business models that could cater to this segment (e.g. monetizing usage data directly through by-products of usage), but they seem to fit smaller services companies like Duolingo or Opensignal. As a result, I expect to see a split in companies that cater to today's mass-market consumers and those that cater to "the next billion". And that isn't necessarily a risk for today's tech companies (for now) because these monetization models also require very different businesses.